On the way back from BriForum, we ran into weather trouble in Atlanta that left us in an over-crowded airport, filled with a whole lot of miserable people (and whiney) kids. 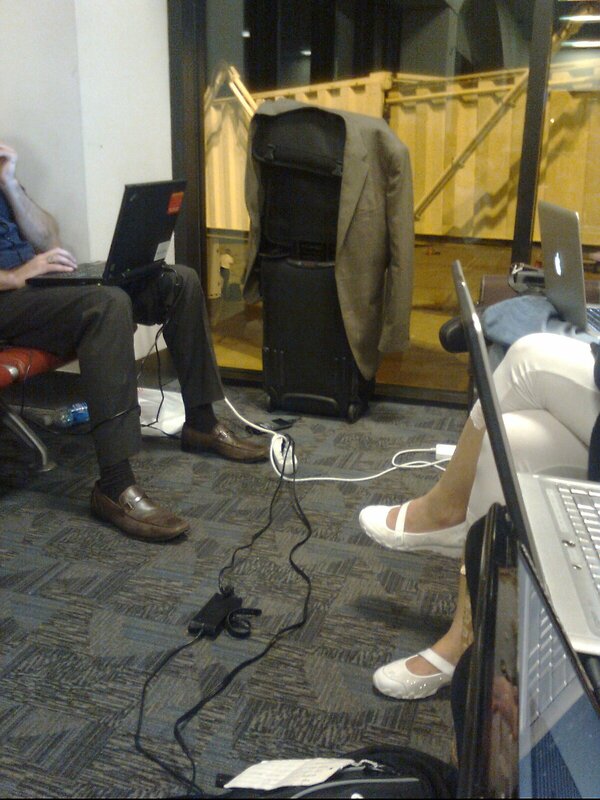 Knowing that we would be stuck for at least another hour, and already having drained my laptop on the previously delayed flight, I scanned for the ever popular electrical outlet. On the way back from BriForum, we ran into weather trouble in Atlanta that left us in an over-crowded airport, filled with a whole lot of miserable people (and whiney) kids. Knowing that we would be stuck for at least another hour, and already having drained my laptop on the previously delayed flight, I scanned for the ever popular electrical outlet. Fat chance on that. Finding them filled, I took a nearby empty seat. The guy next to me gave me a look when I started to unzip my backpack. As far as he was concerned, he was there first and had dibs if a functioning outlet opened up. But no worry. I did something I've never seen anyone do at an airport other than me. And it is so simple! His look, a combination of mistrust and macho ire, changed to one of confusion when I pulled it out. And then he smiled. I got up, unplugged one of the lucky people already plugged into the wall (as politely as possible) and plugged me in. And then the people around me applauded! Note to self. Always pack one of these for future flights. Is Travelling A Non-Contact Sport? Never leave home without one. Add to that a plug converter for the power strip if traveling outside of your usual country/territory. My office is my bag, and these are among the most important items - also great in hotels where there is often just a single outlet on the desk. Well for the hotel room we also brought our own wireless router. Most of my family came along - 3 laptops. Connect the router to the single wired port, Connect up one PC and pay the fare (uses MAC of the router), then have the convenience of any laptop from anywhere in the room. We brought a bunch to Amsterdam for BriForum Europe 2007 so that we could plug in our US equipment to US outlets and only have to buy 1/5th the number of adapters. It worked great, spare one power strip that literally flashed and went up in smoke. Word to the wise - don't bring a surge protector with you, especially to Europe :) They look so similar these days...nobody realized it when it got packed!